Allison O’Neill, PhD, MA is an epidemiologist in the Center for Devices and Radiological Health. Dr. O’Neill received her PhD in Epidemiology from the University of Maryland School of Public Health. 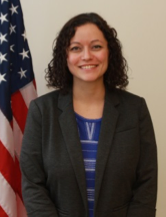 She joined the FDA as an ORISE research fellow in 2012, and became a postmarket epidemiological reviewer in 2013. Dr. O’Neill has experience with regulatory review of women’s health medical devices and the use of real world evidence to support regulatory decision making, and she is currently the FDA liaison for the COMPARE-UF registry.